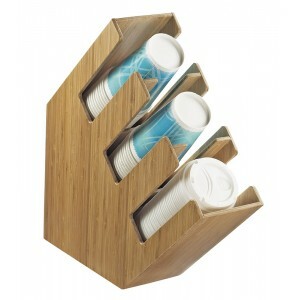 Bamboo Cup and Lid Organizers - Cal-Mil Plastic Products Inc. This angled cup, lid, and straw organizer features 3 separated compartments: All 3 are designed for cups or lids. Perfect solution if you're looking to save precious table space but not willing to compromise the beauty of your display.